The Authors' Circle presents Paul Watkins, author of The Beast in the Red Forest. 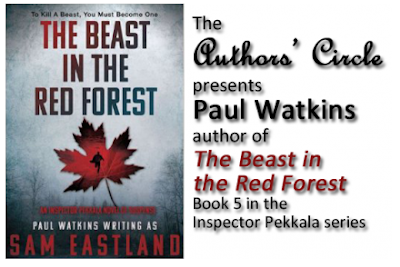 Paul Watkins (writing as Sam Eastland) will be interviewed by publisher, friend, and Tuxedo resident, Glenn Young about his recent book in his Inspector Pekkala series of Novels, "The Beast in the Red Forest." A soldier returns from the frontline of battle to report that Inspector Pekkala's charred body has been found at the site of an ambush. But Stalin refuses to believe that the indomitable Pekkala is dead. On Stalin's orders, Pekkala's assistant Kirov travels deep into the forests of Western Russia, following a trail of clues to a wilderness where partisans wage a brutal campaign against the Nazi invaders. Unknown to Kirov, he is being led into a trap - a new enemy has emerged from the fog of war, more deadly than any Kirov or Pekkala have ever faced before. Pursuing the legend of a half-human creature, said to roam the landscape of this war within a war, each step brings Kirov closer to the truth about Pekkala's disappearance. Meanwhile, Pekkala's nemesis is closing in for the kill.